Originally the furniture warehouse of the Habsburgs, today the Imperial Furniture Collection in the seventh district is one of the largest furniture collections in the world. Furniture culture from three centuries is shown here in 165,000 pieces – from Biedermeier to Historism to contemporary furniture design, everything can be seen here. 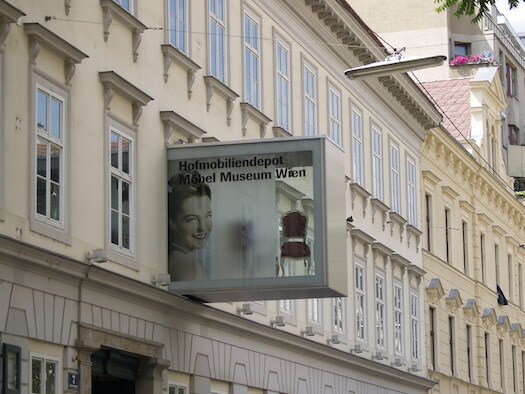 A must-see for all visitors to Vienna who are interested in architecture, furniture, and design. A treasure trove of inspiration. The core of the museum are Habsburg pieces. The originals from Schonbrunn, Laxenburg Palace, Belvedere and many other of the imperial family’s castles are here. There are not only pieces from political events or imperial ceremonies on display, but also everyday things that have been used. In addition to these, particular attention is of course paid to modernity. Pieces by Adolf Loos, Otto Wagner, and Josef Hoffmann – to name just a few – as well as pieces by contemporary designers are exhibited here. The museum also collects furnishings that have otherwise slowly disappeared from the cityscape so that they are not forgotten. Film aficionados, especially Sis(s)i enthusiasts, also get their money’s worth here. Those who have seen the film about the empress can find a Sis(s)i section in which all props that were used in the film are displayed. In addition, Empress Elizabeth’s original furniture is on the opposite side and thus the real Sisi is facing the cinematic version of Sissi. Something very special for Sissi fans. A museum where you can linger for a long time and be inspired – whether as a designer or as a hobbyist. And also easy to reach on a museum day. You can easily walk from our hotel to the art history museum and after that go to the exhibitions in the Museum Quarter. After a break in one of the fine restaurants in the MQ, you can easily get to the Imperial Furniture Collection via the Spittelberg – perfect! If you don’t find anything in the museum shop, but would like to take home a few antique pieces, a detour to the Vintagerie is called for. Have fun!